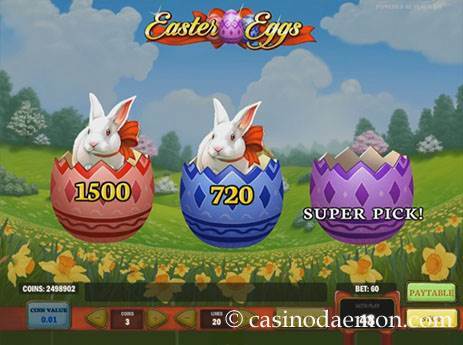 Easter Eggs from Play'n Go is a themed slot for the Easter festivities. 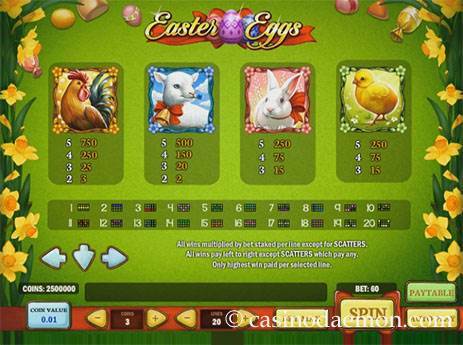 The game features symbols with animals relating to Easter, such as a lamb, a rooster, a chick and of course a bunny too. The lower paying symbols are the standard A, K, Q, J and 10 symbols, but these are designed in a Easter egg style with relating decoration. Overall, the symbols are very nicely drawn, and the game is also supported by nice spring music. The game offers everything expected from a good slot machine, including wild substitutions, scatter wins, free spins and an Easter bonus game. The variance of the slot is low to medium, and you will probably have winning combinations regularly. It is a game that you can play for just a few spins or for a longer time, the free spins and the bonus game can be worth it, but you can also win a lot of money without triggering them. The theoretical return to player is 96.75%, which is higher than average for an online slot. You can also play Easter Eggs mobile on the go, as the game is optimised for mobile devices. Here, you can play Easter Eggs for free without any obligation or risk. If you like the game and would like to try your luck for real money you can find it at one of the online casinos listed on this page. 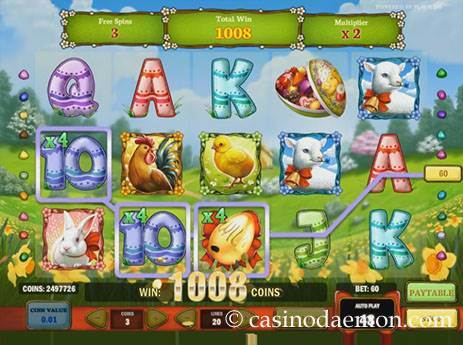 The slot offers many features, starting with the golden egg wild symbol that can stand in for other symbols to create winning combinations, and payouts of winning combinations achieved with the wild are also doubled. The wild doesn't replace the scatter or bonus symbol. There is also a scatter symbol that awards an instant win from 2 symbols and the free spins start from 3 symbols. You can choose from three different free spins modes that let you decide the risk and the potential yield. The bonus game starts with the egg basket bonus symbol on reels 1, 3 and 5. In the bonus game you have to open the eggs that can either reveal coin wins or end the bonus game. There are multiple stages of the bonus game, and with a bit of luck you can open more than one egg. You can also try your luck in the gamble feature and bet your winnings for a chance to either double or quadruple them. Guess the right card colour and double the amount, or guess the correct suit to quadruple it. Remember, you are risking your winnings, and you can also loose them in the gamble. 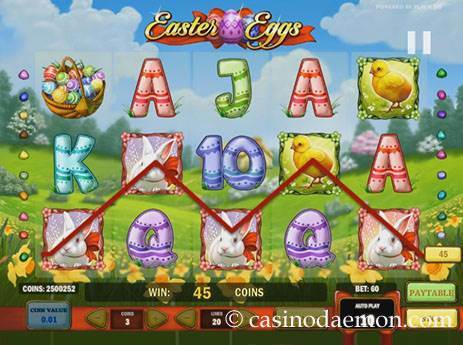 The Easter Eggs slot has 5 reels with 20 variable pay-lines. You can play the game with coin values between 0.01 up to 1 £/$/€ and also play up to 5 coins per line. The minimum wager in one round of 0.01 for one enabled pay-line, 0.20 £/$/€ for all pay-lines, and you can raise your stake up to 100 £/$/€. It is also possible to select automatic play options.